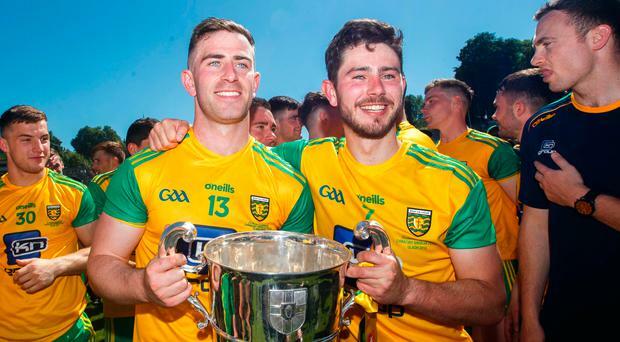 Donegal dashed Fermanagh's hopes of winning their first-ever Ulster title in a one-sided Ulster Final in Clones yesterday. Landing a staggering 2-18, to the Ernemen's 0-12, their overall excellence rivalled the attendance of DUP leader Arlene Foster as a talking point. The wait for their first title goes on for Fermanagh who, along with Wicklow, are the only counties not to have won their provincial championship and their disappointment will be felt all the more keenly given the atmosphere provided by their colourful support. Effectively, the game was decided by two first half goals, with Ryan McHugh at the centre of both. Last week Donegal manager Declan Bonner appealed to referees to protect the Kilcar wizard from rough treatment, but he scarcely needed it as he set up a goal for Eoghan Bán Gallagher and scorched past two Fermanagh defenders to net one himself. Asked about his superb individual goal, McHugh said modestly: "There were a number of great moves and great football today. "We really attacked well this year and it was great to see. It's Championship football. Every day you go out you are going to take hard hits,"
Fermanagh boss Rory Gallagher said of the 12-point gap: "It's very disappointing when you are involved in a team and everyone is together, working really hard and wants the same outcome. We have come a long way with that." Donegal boss Declan Bonner: smiled: "We don't win Ulster titles that often so we will savour this one."